AJ Fernandez came on like gang busters several years ago with the San Lotano brand. Similar to rock bands who have been around for years then suddenly they are discovered as the new sensation. When his San Lotano Oval hit the streets you could not find it in stock just about everywhere. I was one of the cigar dudes who hunted for a Oval and when I scored some, it felt like this was the best cigar every made. I still think it is an outstanding smoke but the allure lost a bit through the years. Today’s review is the New World line which has been in the market place since 2014. Clearly not a new cigar but a steady seller for the AJ team. It’s time to write about it and see if it the hit for me as the San Lotano Oval was. As always, the review is not impacted on how or where I received the cigar. 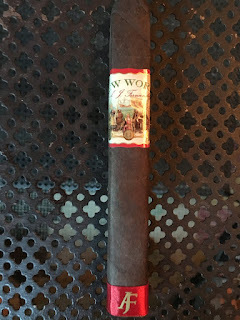 The review are my thoughts on this particular smoke. I suggest if what I comment about interests you, try the blend and make your own opinion. Very dark chocolate in appearance upon first glance but taking a closer look, there are some veins that are evident. I like box press cigars which for me provide a more involved smoke. The cigar band and lower band is a nice counterpoint that makes the wrapper look even darker. It’s a nice touch. I expected a hit of chocolate and it did not disappoint as this was the prominent note in the first third. I thought it would have more of a pepper taste but did not get this. Actually it was quite creamy, and smooth. Its profile would fall something in the medium to strong category. The burn stayed lit and held it’s shape well. The cigar did not tunnel, but did have some minor changes in the direction of the overall burn. This did not hinder the taste or enjoyment of the cigar. Ash was light grey to a darker hue in appearance. The smoking experience was solid throughout the one hour or so time frame. This was a very steady smoke with all the pleasantries of a good smoke. Throw in the very reasonable price point and you have a winner. Here are the numbers. 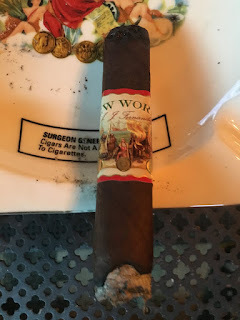 The New World falls into the category of keeping several available in your humidor. 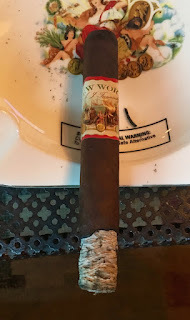 When you cannot find anything negative that counter indicates a smoke which strikes you favorably, I suggest this cigar is a very good choice for just about anytime of the day. *Credit: The Urban Fishing Pole, Frank “Bo” Gerechter.